Well, here we all are back at home, back at work, & back to designing new pieces with all the gorgeous materials I got at all the Tucson shows I attended. I think that I counted attending at least 9 different shows, but it tends to get a bit blurry after the first 5! The final show was the one that started it all–the Tucson Gem & Mineral Society Annual Show. Society members, collectors from around the world as well as vendors put their best stuff out on display, with most of it for sale as well. It fills the main floor & arena floor of the Tucson Convention Center. This photo depicts just a corner of it from the gallery above. 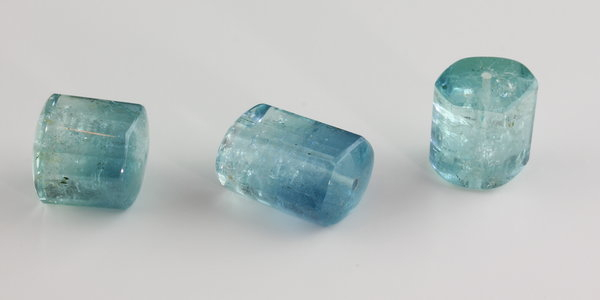 It was worth the wait, as I found some of my favorite treasures, like these natural, unheated aquamarine beads. You can see the original crystalline structure of the gemstone; the crystals were just sliced, polished & drilled to make these massive beads. The trio weights in at over 65 ct! I will probably mix them with some South Sea pearls–the challenge is finding worthy material to accompany them. While obviously not facet-grade, the inclusions make for a very beautiful, natural appearance. Tomorrow is my last day at my “regular” job, so I look forward to devoting myself to making dazzling jewels full time during my early retirement. Mark your calendars–I will be in Pasadena, CA over the Mothers’ Day Weekend at an Artisan Jewelry show–details to follow.